Wentworth Town Hall is located at 292 NC Highway 65, Wentworth, NC 27375; phone: 336-342-8101. Photo: Wright Tavern, ca. 1820, Route 65, Wentworth, North Carolina. Listed on the National Register of Historic Places in 1970. Photographed by C. E. Peterson, 1934, Historic American Buildings Survey [HABS NC-161], memory.loc.gov, accessed October, 2013. Wentworth, the hilltop seat of Rockingham County, is a one-street village with a modern courthouse and jail flanked by old-fashioned houses. Town and county were named for Charles Watson Wentworth, Marquis of Rockingham, a leader of the faction that championed the cause of American independence in the British Parliament. Settlers were mostly English, Irish, German and Scotch-Irish people from Virginia and other colonies to the north. Iron deposits were worked extensively in the early days. 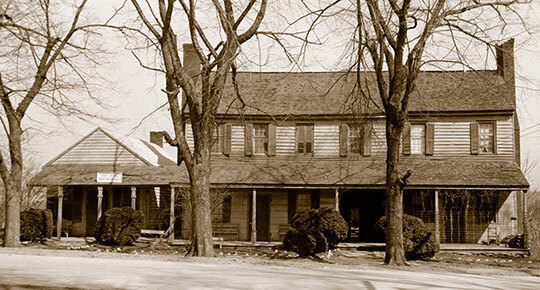 The Troublesome Iron Works, opened in 1770 and named for a nearby stream, was probably the first in North Carolina.